There hasn’t been a Scene It? post in a while as we’ve been furiously discussing the constant stream of The Force Awakens news. However, there is one scene which I haven’t been able to get out of my mind lately so it felt like it was time again. The scene I will be looking at today is one of the final scenes in The Return of the Jedi and is really the scene in which, I believe, the whole saga, as we have it, culminates. However, with what we know about The Force Awakens it also seems to be a jumping off point for some of its characters. The scene I am talking about is Darth Vader’s Funeral at the hands of Luke on Endor. It is a stunning scene. This scene is preceded by the explosion of the second Death Star and Han and Leia getting together, finally. As such some of the biggest story-lines that were set up throughout the trilogy are closed. The one that is left is the relationship between Luke and Vader, which grew in intensity throughout the three films. This scene, more so than the moment before Vader’s death, shows the resolution of this relationship. Darth Vader’s funeral is perhaps the most solemn scene in all of Star Wars. From the cheerful and green Endor Lucas transitions to the dark night which is lit by a single torch. I think it isn’t overly sentimental to suggest that the torch is both representative of Vader/Anakin and Luke. As the Chosen One Anakin was supposed to bring balance to the Force, not ‘leave it in darkness’, as Obi-Wan laments. Luke himself was part of the new hope that saved the Galaxy, bringing light into the Galaxy that had indeed become dark. Next to that, there is the idea of passing on the torch. Luke, in some ways, was burdened with the same task of restoring balance as Anakin was and has also taken on the role of Jedi. Perhaps not all of this was intended by Lucas, but they’re all associations which can be made with the image of the torch. The slow journey of the torch seems almost mystical. It is a conscious step back from the action-packed ending of The Return of the Jedi and a move towards something much more quiet and solitary. The way the camera moves along with the torch to the pyre is very intimate, emphasizing the extent to which this is an emotional moment for Luke. It is interesting to realize exactly how solitary this moment is, since it is just Luke and Darth Vader’s corpse, enclosed by the shadowy figures of the trees. The audience almost feels like they are intruding on a highly personal moment between a son and his father, but also on a Jedi ritual. It wasn’t until the funeral of Qui-Gon Jinn in The Phantom Menace that it was confirmed that cremation was an accepted way of burying a Jedi, but this scene definitely shows the emotional value of this farewell. It also suggests that Dart Vader deserves this farewell because, to a certain extent, by destroying Darth Sidious and saving Luke, he has brought balance to the Force and turned his back on the Dark Side. This is also why I’ve been a supporter of Lucas’ change of Anakin’s Force Ghost to Hayden Christensen because in Anakin has stopped being Darth Vader, the persona Darth Sidious has created for him. 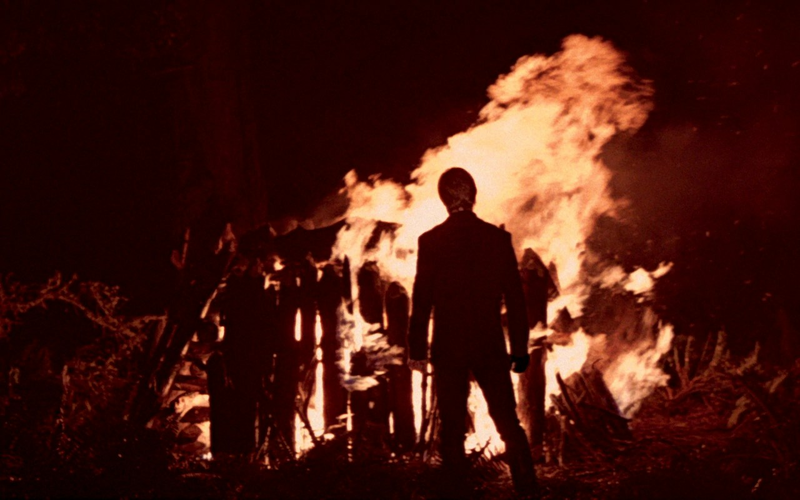 This cremation scene therefore is also a memorial to Anakin Skywalker as he was. Cremation such as this, on a pyre in the open in full “armour”, is something that in ear;y medieval literature is reserved for heroes. Most notably Beowulf, in the eponymous poem, is given a funeral such as this towards the end of the poem after he has defeated the dragon and died. In the final sections of the Old English poem Beowulf, now an aged king, decides to face the dragon on his own but is saved by one of his warriors, Wiglaf, who stays with him till the very end. The parallels to Luke and Darth Vader here are relatively strong. Darth Vader finally faced the “dragon” that was Darth Sidious and Luke was there by his side when he died. Anglo-Saxon literature and poetry is suffused with a tone that is both mournful and glorious which especially comes out in that passage in Beowulf. On the one hand it is a tragic moment because Beowulf is dead, but it also celebrates his glory and certifies him as a hero. Similarly, this scene in The Return of the Jedi is dejected and sorrowful, but there is also something terrific, in the good sense, about it. Darth Vader, or rather Anakin, is given a hero’s farewell, a final tribute to all he stood for, all he sacrificed and even all he did wrong. 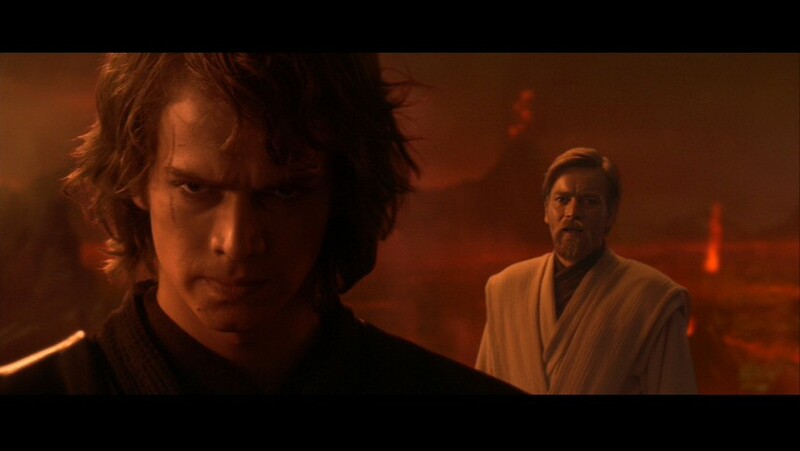 It also contrasts nicely against the immolation scene in The Revenge of the Sith which, in some ways, represents the end of Anakin Skywalker, whereas this is the end of Darth Vader and a return to Anakin. What really adds emotion to this scene is the music. John Williams’ Force theme is one of the most beautiful tracks in the history of soundtracks, but in this scene it is very stripped back. Not only does it add to the intimate feel of the scene, it also emphasises the strong bond both Anakin and Luke have with the Force. The Force accepts Anakin back and allows him to become a Force Ghost, something Sith, according to Lucas, cannot become. The brightness of Anakin’s fire in contrast with the darkness around him is a beautiful symbol of this and the strength of the Force theme only enforces that. This scene is also very important to Luke, whom I haven’t really focused on yet. Luke here chooses to give his father a funeral fit for a Jedi, something none of the other characters might have done. It is a healing moment for him as well, another moment where, ruled by his emotions, he makes the right choice. His first choice was to trust his father, the second one was to honour him. What the screencap below shows really well, I believe, is the mix of emotions. On the one hand Luke seems to accept what has happened, who his father is and that he is his own man. On the other hand, there is a sadness there because this means he will never know what it’s like to have him as a father. It also shows how much Luke has aged since A New Hope. This is truly the moment in which Luke says farewell to his father because when he joins his friends a scene later he seems relieved, if anything. It is significant that Leia isn’t here because she had a very different relationship to Vader than Luke did. It’s debatable whether she should have been there, but for Luke this truly seems like the end. I can’t help but see the similarity in mood between this shot and the scene in RotJ. The robotic hand suggests that this is Luke whereas the sparks suggest another fire. Although it doesn’t necessarily have to be another funeral pyre I strongly suspect that it may be. There is the same darkness surrounding the fire and Luke and the gesture Luke makes to R2-D2 seems comforting, more than anything. This isn’t the space to speculate, but the resemblance suggests that something similar may be happening here. Darth Vader’s funeral was always one of my favourite scenes in The Return of the Jedi and the whole Originals Trilogy overall. It is a moment which is profoundly emotional and solemn, a scene which is truly all about Darth Vader/Anakin and Luke. It is the honourable, heroic end for a man who spent a large part of his life fighting for what was right until he became what was wrong. It is also the moment where Luke can let go and can clearly set himself apart from his father. It’s a scene unlike any other in Star Wars but it’s also an Originals scene that finds echoes both in the Prequels and in the Sequels.